While the job duties and responsibilities remain the same across shifts, nurses on the night shift are presented with unique challenges. The shift's schedule and atmosphere require nurses to significantly adjust their daily lives and routines to meet its demands. Adapting to the night shift can be a challenge. Here are our top eight tips. Working overnight will interrupt your natural sleep pattern; therefore you need to reprogram your body's sleep schedule accordingly. Make sleep a priority at home. Sleeping for long periods of time without any interruptions is best for your body and mind. In addition, it’s important for night shift nurses to keep the same sleep schedule even on the weekends. When your brain perceives darkness, it produces melatonin, the sleep hormone. Make your bedroom mimic nighttime during the day with blackout curtains or shades and eye masks. Be sure to disconnect all possible interruptions like phones, electronics or doorbells. While caffeine can help maintain or improve alertness while offsetting fatigue for night shift workers, be careful not to overdo it. Eliminate any caffeine towards the end of your shift to help ensure proper sleep. What you eat before and during the night shift will have a significant impact on your energy, stamina and overall performance. It’s important to choose items that will provide you with energy without a crash later in the shift. Opt for well-balanced smaller, more frequent meals consisting of high-protein, complex carbs and low-fat foods. Try to incorporate proteins like tuna, eggs, string cheese, turkey, peanut butter and tofu into your meals as they increase alertness and focus. Remember to stay hydrated by drinking plenty of water to reduce the chance of fatigue and headaches caused by dehydration. While the lights throughout most facilities are kept dim overnight so the patients and residents can sleep, try and keep the lights on bright at the nursing stations or break rooms to help fool your brain. Then on your way home from work, wear sunglasses to reduce brain stimulation from the daylight. 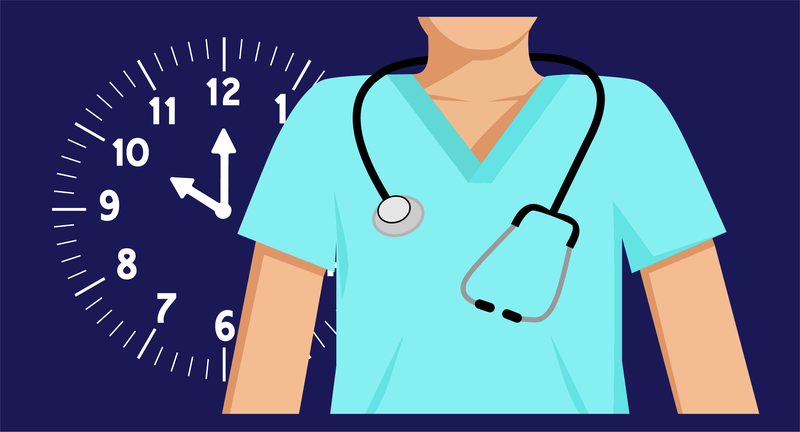 Night shifts typically are less hectic than during the day as the majority of patients or residents are asleep. Try and keep yourself busy in between continuously monitoring patients throughout the night with simple activities that can be quickly put aside to help a patient. Some examples of ways to keep your brain occupied throughout the night shift are reading books or magazines, solving Sudoku puzzles or knitting. Time flies when you’re having fun! Help your shift go quickly by engaging and getting to know your co-workers. Lifelong friendships often develop on the night shift. Working the night shift most likely means you're on an opposite schedule of your friends and family, but don't let it interfere entirely with your social life. Make sure you plan family time and date nights for your days off. 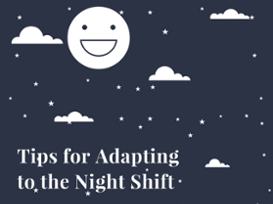 Adapting to the night shift can be challenging, but after a while you’ll find the methods that work best for you while you adjust to your new routine.